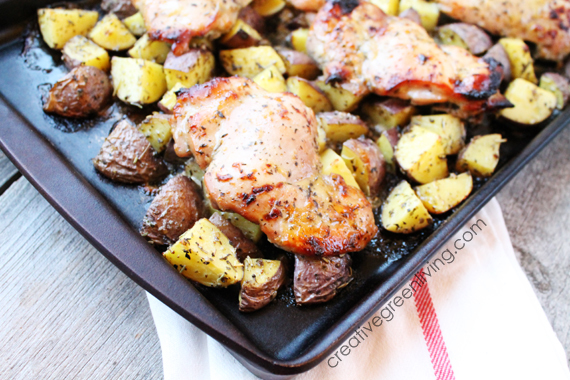 If you need an easy weeknight dinner that doesn't make a big mess, this recipe is for you! Make the marinade and add the chicken - keep it in the fridge until you're ready to go (for up to a week!). Because you roast the potatoes in the same pan, there is less mess to clean up. Steam some green beans on the stove or in the microwave for an easy vegetable to round out the meal. Make the marinade for the chicken by whisking together all the "chicken" ingredients - except the chicken. Add chicken pieces and toss to coat. Set aside to marinate at least one hour. If you are making this several days ahead, cover the bowl and refrigerate until ready to cook then resume on step 2. Cut potatoes into bite size pieces. Drizzle with olive oil and toss with herbs, salt and pepper until well coated. Spread potatoes in a single layer on a cookie sheet. Remove chicken pieces from marinade and place on top of potatoes. Bake at 400 degrees for 35-40 minutes or until chicken is cooked through and reaches an internal temperature of 165 degrees. 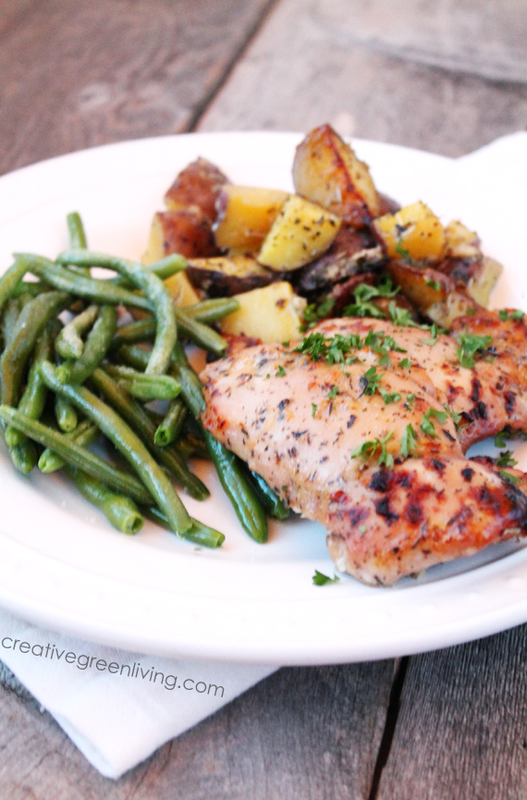 Serve chicken with potatoes and a steamed vegetable like organic green beans for an easy week night meal! 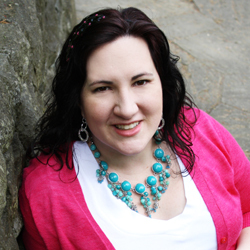 Carissa is a professional recipe developer and a mom of two active boys. The owner and lead writer for Creative Green Living, she is also the author of two e-books including the best-selling beverage cookbook, Infused: Recipes for Herb & Fruit Infused Water, Tea and More. You can also find her recipes featured in The Non-GMO Cookbook as well as in periodicals like Urban Farm Magazine. Her goal is to empower families to make healthier choices that are easy, taste great and are fun!